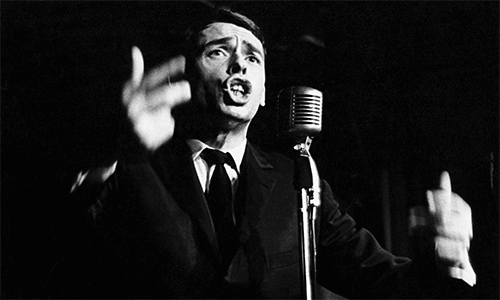 Jacques Brel’s most beautiful songs performed in a most original way. BREL & BRASS is Micheline Van Hautem's latest and most prestigious project to date. There are quite some artists out there who bring songs by Jacques Brel, but Micheline Van Hautem's BREL & BRASS is a completely different approach. For her one-of-a-kind project, a series of fine arrangements solely for wind instruments and percussion have been written by acclaimed composers Peter Habraken, Jan Nellestijn and Guus Janssen. For each of her BREL & BRASS concerts, Micheline performs with a totally different local harmony orchestra, marching band, concert band or brass band. In The Netherlands top bass trombone player Jos Jansen joins her as special guest. This is a true win-win situation, whereby the local bands are happy because of the chance to show off their musical skills and Micheline is happy to share her beloved repertoire in a totally original and attractive way. BREL & BRASS is truly an exceptional experience. * According to Wikipedia, a concert band, also called wind ensemble, symphonic band, wind symphony, wind orchestra, wind band, symphonic winds, symphony band or symphonic wind ensemble is a performing ensemble consisting of members of the woodwind, brass and percussion families of instruments, along with the double bass or bass guitar. On rare occasions, additional non traditional instruments may be added to such ensembles such as piano, harp, synthesizer or electric guitar. Though the instrumentation is similar, a concert band is distinguished from the marching band in that its primary function is as a concert ensemble. Whereas a brass band is a musical ensemble generally consisting entirely of brass instruments, most often with a percussion section. Her revue "Songs of Jacques Brel" leads her more than once to the annual Edinburgh Festival, where she is honoured with the much-coveted Herald Angel Award, and then on to Australia, where she also performs to packed audiences. Back in the Netherlands, where she sells out the Concert Hall in Amsterdam, she is received with equal rapture. Of the CD version of 'Songs of Jacques Brel' more than 15.000 copies find their way to the homes of Micheline's admirers. Her worldwide travels inspire Micheline to compose songs of her own, resulting in her first solo-CD, "Chocolat", which contains a carefully chosen array of songs written by Micheline spiced up with reinterpretations of songs of others. Accompanied by Erwin van Ligten, her musical partner on guitar, she goes on to perform "Chocolat" all over the world. On "Crème de la Crème" Micheline sings a surprising collection of songs by artists such as David Bowie, Nina Simone, Herman van Veen and Frank Boeijen, translated for the very first time into French. And now, there's "BREL & BRASS", an unprecedented project that features eleven of the most beautiful chansons of Jacques Brel performed by Micheline backed by Kempenbloei, a full-blown Belgian marching band. The arrangements of the songs have been specially written for brass, wind and percussion instruments. In her new live show, Micheline collaborates with the local brass band of the town or village where she performs "BREL & BRASS". Thus, for this out-of-the-common performance, Micheline surrounds herself with an orchestra of up to eighty passionate musicians. Jacques (Romain Georges) Brel was a Belgian singer, songwriter, actor and director who composed and performed literate, thoughtful and theatrical songs that generated a large, devoted following - initially in Belgium and France, later throughout the world. He was widely considered a master of the modern chanson. Although he recorded most of his songs in French and occasionally in Dutch, he became a major influence on English-speaking songwriters and performers such as David Bowie, Alex Harvey, Leonard Cohen, Marc Almond and Rod McKuen. English translations of his songs were recorded by many top performers in the United States, including Ray Charles, Judy Collins, John Denver, Nina Simone, Frank Sinatra and Scott Walker. Brel was also a successful actor, appearing in over a dozen feature films. He also directed two films, one of which, Le Far West, was nominated for the Palme d'Or at the Cannes Film Festival in 1973. Having sold over 25 million records worldwide, Brel is the third best-selling Belgian recording artist of all time. The new arrangements for concert & brass band are available on sheet music. Besides the Brel chansons with Micheline Van Hautem, the local band is welcome to perform 30 minutes of their own choice of French inspired instrumental repertoire. The new arrangements have significant trombone parts. Jos Jansen, Dutch special guest on bass trombone, is happy to join us although a local guest musician performing the trombone solo parts is also welcome to star at BREL & BRASS. Micheline is available to rehearse with the local band preferably in the afternoon on the day of the concert. Micheline requests a 60 minutes talk through with the conductor in the week leading up to the show. The orchestra is kindly requested to thoroughly know their parts before the start of the rehearsal with Micheline. A technical rider for the singer and her trombone player, with information about sound and light, is available. It is up to the local band to arrange their specific technical requirements directly with the venue. Sound and light technicians, whom will be in charge of the performance, have to be present at the rehearsal. Micheline Music & Brell & Brass takes your privacy very seriously and shall handle your personal data with the utmost security and care. In this Privacy Statement you will learn how we handle your data as well as learn about your rights concerning our processing of your data. We advise that you read this Privacy Statement thoroughly. Should you have any questions or remarks, please contact us at micheline@michelinemusic.com. Micheline Music and Brell & Brass is the SARL Micheline Music - Zaza SARL, with registered office at (0614 ) Vence, France listed at the Traderegister of the French chamber of Commerce under 800 532 392. Micheline Music is as the controller ultimately responsible with regard to the processing of your personal data. How does Micheline Music use your personal data? Underneath you will find an overview of the purposes for the processing of your personal data. You will also find a specification of which data Micheline Music uses for that specific purpose, the legal justification, and the amount of time Micheline Music keeps this data. For clarity’s sake, we have categorised the purposes. Micheline Music has obtained your data because you have provided this data to us. .
You may access your personal information and make any necessary changes in your account. If you would like to see which personal data Micheline Music has obtained about you, you may exercise your right of access by submitting a request to Micheline Music. If you wish to make changes to the personal information that you have seen as a result of a request for access and you are unable to make the changes yourself in your account, you may request that Micheline Music makes these changes for you. You may request that Micheline Music modifies, corrects, supplements, erases or shields your information. You also have the right, under certain conditions, to ask Micheline Music to restrict the processing of your personal data. If processing of your data takes place on the grounds of 'legitimate interest' by Micheline Music or a third party, you have the right to object to that processing. You have the right to obtain your personal data from Micheline Music. Micheline Music will provide this in a structured and commonly used format, which can easily be opened using commonly used digital systems. When the legal basis for a particular processing is your explicit consent, you have the right to withdraw that consent. This does not affect past processing, but does mean that we will no longer be allowed to process this data in the future. It may also result in Micheline Music no longer being able to provide you with certain services. A request can be sent to micheline@michelinemusic.com. Micheline Music will comply with your request as soon as possible and in any case no later than one (1) month after Micheline Music has received such a request. If Micheline Music rejects your request, we will indicate in our reply why the request was rejected. It is possible that Micheline Music is required to submit your data to a third party, for example to fulfil a legal obligation. What are cookies and how does Micheline Music use them? Cookies are small pieces of (text) information that are sent to your browser when you visit the website of Micheline Music and then stored on the hard disk or in the memory of your device. The cookies placed via Micheline Music’s website cannot damage your device or the files stored on it. With 'cookies', we also mean comparable techniques collecting information, such as device fingerprinting. If you have any questions regarding this Privacy Statement or the way in which Micheline Music uses your data, you can send an e-mail to micheline@michelinemusic.com . If you have a complaint about the way your data is processed, please send an e-mail to micheline@michelinemusic.com . Furthermore, you always have the right to contact the competent national data protection authority. In The Netherlands, this is the Autoriteit Persoonsgegevens . Aged sixteen, before obtaining his Gymnasium diploma, Peter Habraken visited open days at all Technical Universities in the Netherlands. He opted for Mechanical Engineering at Enschede. However, with his heart set on a musical career, Peter changed to studying music after only four weeks, resulting in three certificates in music: classical clarinet, brass band conducting (both at the Enschede Conservatory) and jazz clarinet (Royal Conservatory of The Hague). For eight years, Peter was clarinettist and contrabass clarinettist in the Marine Band of the Royal Netherlands Navy. During that period he developed himself as conductor of a wide variety of ensembles – from classical choir to big band – and as composer/arranger. From 2007, when he left the Marine Band, he has followed his artistic ambitions in composing, conducting, and playing the clarinet. The Dutch conductor / arranger / composer Jan Nellestijn (1960) began his career as a cornet / trumpet player in 1987 at the then Johan Willem Friso Kapel in Assen. He studied trumpet at the Arnhem Conservatory. Meanwhile, as there was increasing interest in conducting, he begun with the 1st phase of the management diploma HaFaBra. In 1997 he was appointed as Chapel master at the Brass Band of the Royal Netherlands Army (FKKL) in Vught. To obtain his master in conducting he studied with Jan Cober at the Tilburg Conservatory. In 2000 followed his appointment as chief conductor of the FKKL. Because of his broad interest in music, he followed a course in Tilburg on light music theory and composition in Leuven with Jan Van der Roost.